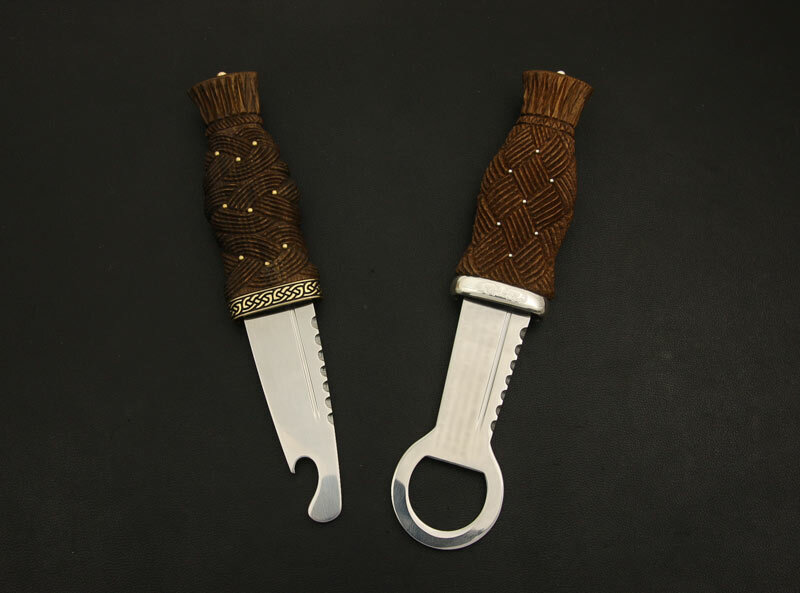 Sgian Brews | What's New at Rainnea Ltd.
Here’s a couple of the prototype Sgian Brew ‘blades’ shown in a previous post made into Sgian Brews – finished just in time for some testing over Hogmanay…. Here’s 3 new Sgian Brew ‘blades’ for our safety / bottle opener Sgians. These are prototypes of our own exclusive designs and we’re looking for feedback before having a larger batch made. 1: The old style cast Stainless Steel generic opener which we’ve been using which doesn’t have much room for engraving. 2 and 3: New styles with and without a taper on the blade section, these would also need to be worn without a sheath. 4: A different style which is more blade shaped and fits into one of our existing sheaths. The new designs are 3mm throughout their width – so there’s no sharp or even thin edge which could be sharpened. We developed the ‘Sgian Brew’ some years ago when it started getting more difficult to travel or gain entry to some places while wearing the traditional Sgian Dubh. I often find that a bottle opener is pretty useful on the occasions that I’m wearing my kilt anyway ! A one of a kind ‘Sgian Brew’ ! Here’s a very unusual ‘Sgian Brew’ we made as a one off special commission.